The "Lone Star" state offers a number of scenic Gulf coast beaches and Texas beach vacations that are fun, affordable, and convenient for those living in the Southwestern and Southeastern United States. From Port Isabel near the Mexican border to the barrier islands near Corpus Christi to the picturesque seaside town of Galveston, just outside of Houston, Texas offers a wealth of beach attractions. The southern tip of the 130-mile long barrier island called Padre Island, this popular Spring break destination is located almost at the Mexican border. Known for its rolling dunes and casual lifestyle, South Padre Island offers visitors miles of beach, fishing, bird and wildlife viewing, and excellent seafood restaurants. It's a great destination for the entire family. Historic Port Isabel lies at the very end of Padre Island, just a few miles from the Mexican border. The seaside town boasts a restored lighthouse and keeper's cottage, first let in 1853 as well as a museum filled with treasures from the Gulf and 16th century Spanish shipwrecks. The area offers miles of beach, excellent fishing, and a long boardwalk for runners, sightseers, and those just wanting to enjoy the sea air. 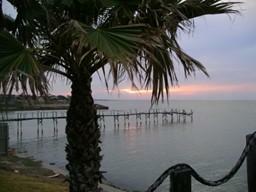 Galveston is located about an hour's drive from Houston on a barrier island connected by a causeway to the mainland. The city is noted for his historic 19th century architecture, its 10-mile long sea wall, and its 32 miles of beach. Galveston also plays host to several festivals each year, including a festive Mardi Gras celebration, the Galveston Jazz and Blues Festival, and the December Dickens Christmas Festival. Galveston Island State Park, on the west end of the island, is a favorite of beach lovers, hikers, fishing enthusiasts, and mountain bike riders. The park is known for its lovely rolling sand dunes and its spectacular Gulf sunsets. Corpus Christi, in the middle of Texas' Gulf coast, is the northern point of Padre Island National Seashore, the longest barrier island in the world. Corpus Christi, connected by a causeway to the island, is a modern, cosmopolitan city with a historic Victorian neighborhood, vibrant marina, and a host of festivals, including the three-week "Festival of the Arts," held each spring. Just east of the city is Padre Island National Seashore. This 70-mile long undeveloped island is lined with white sand beach and is home to a myriad of animals and birds, including the endangered Kemp's Ridley Sea Turtle. Centrally-located Texas is easily accessible from all over the United States, with connections via the major hub airports of Dallas and Houston. The Texas beaches are also within driving distance of other Gulf states, such as Mississippi and Louisiana, as well as the Florida Panhandle. Accommodations along the Texas coast range from resort hotels to bed and breakfast inns to large and small beachfront condos. A car rental is a definite asset for Texas beach vacations, as most of the beaches and attractions are spread out along the coast.